The Smithsonian Institution National Museum of Natural History has substantial Fijian collections of objects that were collected during the United States Exploring Expedition (1838-1842) commanded by Charles Wilkes, whose ships visited Fiji in 1840. The museum also houses Fijian material that was acquired later in the 19th century. During the past several years, Smithsonian staff have documented the Wilkes material and conducted preliminary research on aspects of it, but it has not been subject to comprehensive analysis or integrated into an art-historical overview of Fiji. 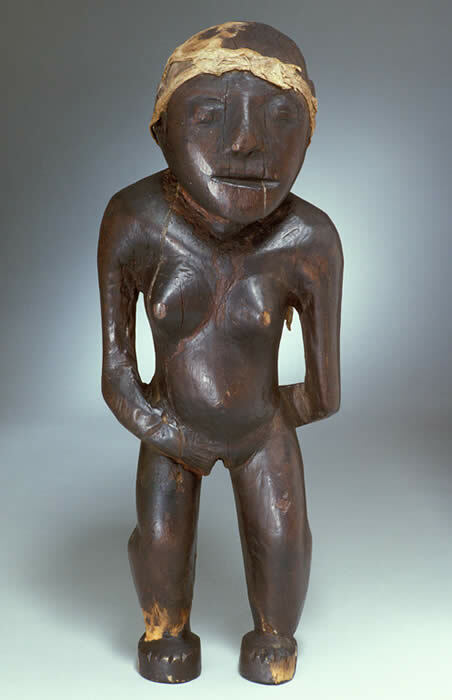 Wooden female figure; wood, barkcloth; 40cm x 15cm. From Bua Bay, Vanua Levu, figure was collected between 1838-1842 by Lt. Charles Wilkes of the United States Exploring Expedition. Smithsonian Institution, National Museum of Natural History, E2998-0 (photo: Smithsonian Institution, National Museum of Natural History).